775 LUXURIOUS ROOMS INCLUDING 395 EXQUISITE SUITES ARE RICHLY APPOINTED WITH HANDCRAFTED RICHELIEU FURNITURE ENGLISH WOOL CARPETS ITALIAN MARBLE BATHS AND DOWN COMFORTERS AND PILLOWS. ELEGANT FRENCH DOORS SEPARATE THE BEDROOM FROM THE LIVING AREA IN THE ASTONISHINGLY SPACIOUS 880 SQUARE-FOOT SUITES. 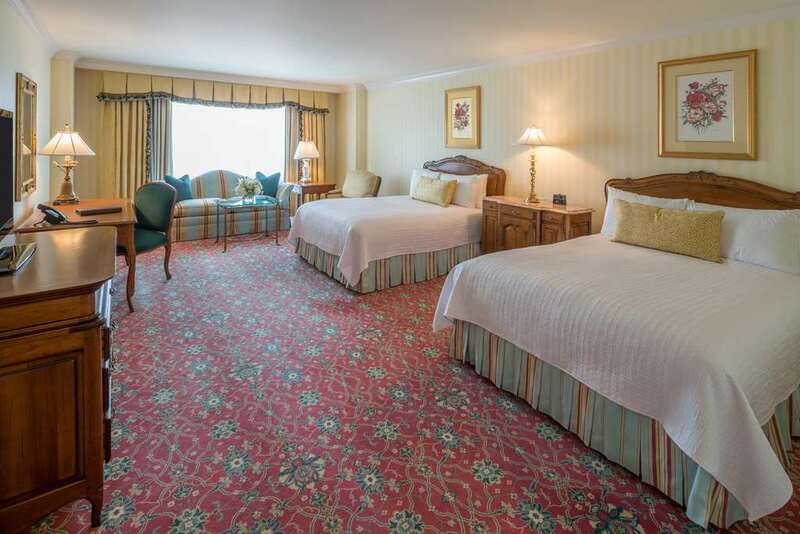 ALL GUEST ROOMS OFFER COMPLIMENTARY IN ROOM WI-FI ACCESS and IHOME CLOCK RADIO 32-INCH TELEVISIONS DUAL-LINE TELEPHONES AND LARGE WINDOWS WITH STUNNING MOUNTAIN VIEWS. A WORLD-CLASS SPA WITH STATE-OF-THE-ART FITNESS CENTER AND BOTH INDOOR AND OUTDOOR POOLS PROVIDES GUESTS WITH UNPARALLELED LUXURY EXTRAORDINARY AMBIENCE AND EXCEPTIONAL SPA SERVICES. ADDITIONAL AMENITIES INCLUDE BUSINESS CENTER VALET AND CONCIERGE SERVICES RETAIL SHOPS LOUNGES AND 1200 COVERED PARKING SPACES. A SPACIOUS CENTRAL COURTYARD WITH MAGNIFICENT FOUNTAIN AND GARDENS IS AN IDYLLIC SETTING FOR AN EVENING STROLL OR MORNING COFFEE BREAK. MURANO CRYSTAL CHANDELIERS MYRIAD ANTIQUES AND ARTWORK ENGLISH WOOL CARPETS ITALIAN CARRARA MARBLE AND FINE FABRICS ADD TO THE MUSEUM-LIKE AMBIENCE OF THE EXPERIENCE. DINING AT THE GRAND IS NO LESS SUPERB WITH AWARD-WINNING IMAGINATIVE CUISINE BY RENOWNED CHEFS WHOSE VARIED CULTURAL INFLUENCES IMPART SUBTLE EXOTIC FLAVORS TO A TRADITIONAL FARE. THE GRAND OFFERS 75000 SQUARE FEET OF MEETING SPACE WITH 3 ORNATE BALLROOMS AND 21 EXQUISITE MEETING ROOMS SUPPORTED BY AN IN-HOUSE AUDIO VISUAL PROVIDING THE LATEST IN TECHNOLOGY SERVICES AND EQUIPMENT. THE GRAND IS LOCATED IN THE RUGGED HEART OF THE MOUNTAIN WEST JUST 30-45 MINUTES FROM 10 WORLD-CLASS SKI RESORTS AND 30 MINUTES FROM 25 GOLF COURSES. AN AFFORDABLE LUXURY RETREAT FOR THE LEISURE TRAVELERS AS WELL AS A PERFECT VENUE FOR WEDDINGS MEETINGS. Inroom dining: Whether you desire a sumptuous snack an intimate dinner or a late morning breakfast in bed our in room menu offers extensive options to satisfy your cravings. Enjoy your meal served in the comfort of your living area or on an intimate window-side table where you can enjoy amazing views while you dine. LOCATED IN DOWNTOWN SALT LAKE CITY. ONLY MINUTES FROM THE COMMERCE DISTRICT JUDICIAL DISTRICT DINING AND ENTERTAINMENT. 30-45 MINUTES FROM 11 WORLD-CLASS SKI RESORTS.